Identification Labels help you to create a well marked job. Ground labels are mandated by standards. Telling where and how to ground your product is an essential part of many equipment manufacturers duty to warn. Both the NFPA 79 and IEC 60204 standards have sections in them that specifically require terminals and supply points to be properly labeled. Electrical ground labels meet the IEC 60417 for the universal symbol to identify earth ground. 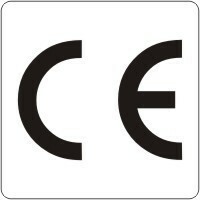 CE Mark labels identify products conform to the relevant European Directive for safety and quality. 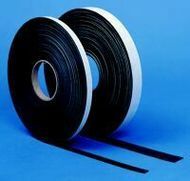 These adhesive-backed paper labels are required on earth ground connections. Place on exposed wiring and meet international safety specifications. The CE Marking (also known as CE Mark) is a mandatory conformance mark on many products placed on the single market in the European Economic Area (EEA). The CE Marking certifies that a product has met EU consumer safety, health or environmental requirements. CE stands for Conformite' Europeenne, French for "European conformity". By affixing the CE marking to a product, the manufacture- or his sole responsibility- declares that it meets EU safety, health and environmental requirements. * The size of the CE Marking must be at least 5 mm, if enlarged its proportions have to be kept. Negative Current Graphic Label- IEC Electrical Ground Label- 1/2"